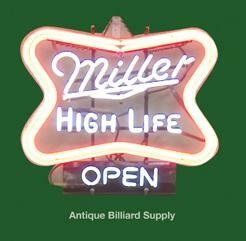 #10-17 Antique lighted neon beer sign provides just the right atmosphere for an antique Brunswick pool table. Manufactured in the 1950s and 1960s, good working condition. Miller High Life brand shown, others available.